Check the Complete CGI Off Campus 2019 Drive information through this post. Apparently, CGI is hiring Freshers who had Finished their Graduation or Post Graduation in 2019 or 2018 for various vacancies across India. Therefore, if you have finished either graduation or post Graduation can check the process to attend the CGI Off Campus 2019 Drive. For this purpose, initially, you have to make your online registration. So, CGI is expecting to hire many Freshers across the Country in Cities such as Bangalore, Chennai, Delhi, Hyderabad, Mumbai, Pune, Noida, Gurgaon, Cochin, Ahmedabad, Kolkata etc. This is surely a good chance for all Freshers to grab a chance to get placed in the organization like CGI. Do not worry about the Details regarding CGI Off Campus 2019, as we have tried to include all of them. Therefore, check this post further. Looking for Jobs in IT sector then should surely attend the CGI Off Campus Drive 2019. And, the CGI also mentioned that they accepting the Registration of the Candidates who 2018, 2019 Passed out. To make your career with CGI all you have to do initially, register online. And then attend for the CGI Off Campus 2019 Drive. By going down in this article, you can find information regarding, Steps for Online Registration along with needed eligibilities. So, CGI is a Software and Business Process Outsourcing Company. And it is hiring all the Freshers Graduates and Post Graduates across India. 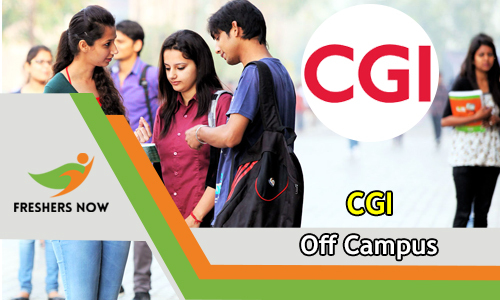 Therefore, all the interested candidates who want to make their career with a top company like CGI you have made your registration and can attend the CGI Off Campus Drive 2019 for Freshers. So, apparently, CGI is expecting to hire Fresh and Talented Candidates into the organization. As of on April 2017, CGI has more than 70,000 employees. Many of Fresher Candidates want to make career shine by working with an MNC. Then this opportunity is for all such candidates. CGI is providing services like application services, business consulting, business process services, IT infrastructure services, IT outsourcing services, and systems integration services across the Globe. Following are the set of Documents which all the Candidates need to carry while attending the CGI Off Campus Drive 2019. Remember to carry at least 2 sets of each document. These are mandatory. Therefore, check them all to get an idea. Mark Sheets of 10th Class, 12th Class, Graduation, Post Graduation, and other courses. Now to consider all the Freshers for the Recruitment rounds, they need to have the following eligibilities. Then only their CGI Off Campus 2019 Drive online Registration will valid. Check them all to know whether you have them or not. All the Passed out of 2018, 2017, 2016 are eligible to take part in the CGI Off Campus Drive. CGI has asked all the Freshers who had finished BE / B.Tech / ME / M.Tech, M.Sc in Computer Science / Information Technology MCA with B.Sc / B.Com / BCA / BA or any other Graduation or Post Graduation Courses, to apply for the Off-Campus Drive. Also, a minimum of 1 year Education Gap is acceptable. Minimum 60% Aggregate is mandatory. The CGI Online Written Test comprises of questions from Quantitative Aptitude, Verbal Ability, and Logical Reasoning. The total papers consist of 25 questions and the time duration of the exam is 30 minutes. Along with the eligibilities, CGI is also expecting all the applicants to have the following Skills. Check them to get awareness about the Requirement of Skill Sets. Should be able to work 24X7 shifts, if necessary. Can be able to extend the Work Hours, if necessary for the Project. Able to manage Team, and handle the Client. Can fit into any team. Should have Excellent Communication and interpretation skills. Also have command on MS Office, Programming, and other Computer technicalities. Navigate to the Careers section. Enter all the correct information. Hope all the details given on this page about CGI Off Campus 2019 Drive for Freshers. For more such updates and notification, consider coming back to our site Freshersnow.com often.